Such fun! Geno in southern California, sent a couple fresh catches from his Blackberry. 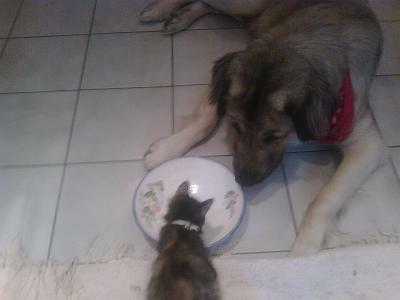 Above is Helmut chowing down while the kitten, Stinky, looks on. He's primarily on raw food, making it all the more awesome about his tolerance. It's cool he lays down while he eats, too. His sister Coco, who lives with me is much more possessive about her dish and even though Molly, Boone and Ruya eat in different places, Coco sometimes double checks to be sure they aren't eyeing her food before chowing down. 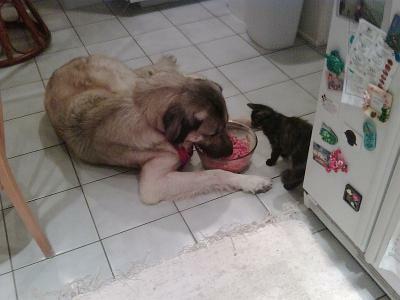 My late Anatolian service dog, Aslan, was also very sweet about his food. When he ate, he would stand but always wagged his tail slowly through out the entire meal. It was so endearing and he did this his whole life (almost fifteen years) starting at about a year in age. None of my other Anatolians have done that spontaneous tail wag through the meal, although some do wag if I talk to them while they eat. Another Aslan memory is back from about 15 years ago when I got an 8 week old kitten from a co-worker, that tiny little monster used to get INTO Aslan's food and eat while he was trying to chow. Aslan would watch her a bit then come over to me with this expression on his face, like disbelief... and indicate that the brat was in his food and would I please do something about it? I would have to retrieve that kitten and hang on to her so he could eat in piece. It was funny, but oh so sweet. Geno's been calling his kitten "Stinky", which is funny to me, as the kitten that used to steal Aslan's food was called "Awful" by James and I. :) Awful was not a very friendly kitty. She enjoyed being cuddled and held, and would at times demand this, as cats do, by getting on top of whatever you're reading or doing, but IF you initiated contact with her by picking her up for cuddling, she'd scratch and even try to bite you. It had to be on her own terms, then she was sweet as anything. Thus her name stuck! Beach Boy that he is, he enjoys his outings to the beach but Geno says Helmut is finally enjoying being in the surf. I love this picture. Amazing what can be done with a Blackberry! My dogs would eat blackberries. One of my guys ate the first and only apple on my dwarf tree. I had a little mutt that loved watermelon. 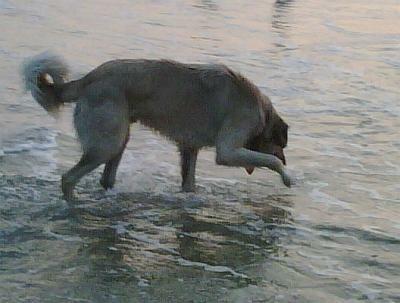 Love the picture of Helmut biting the water. My dog did that too. The cat who didn't like to be picked up and cuddled but came to you for affection on his own terms is typical. In nature cats are only picked up off of the ground when they are being attacked, killed and eaten. your Molly looks a lot like my Polly. We were told she was a Pyr/Anatolian mix. She is now 5 months old and weighs almost 60 pounds. 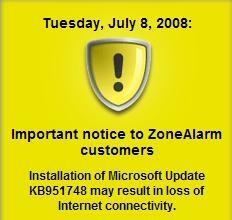 On the date in the image, a routine Windows Update presented some ZoneAlarm users with a present... OUCH. James had some choice words about this sudden mysterious inability to get onto any accounts he was working on. ZA homepage had the above yellow alert, and contained a clickable link to get the new ZA fix. Our internet service with Comcast was pretty unstable back in June, with some days for at least a week, where there was no internet connection at all and weeks around that period when it was too much a bother to try to do anything on line at all. Things have improved although there are some of the usual bouts of disconnects throughout the day. I did find out that Comcast had apparently been attacked successfully by hackers, which might have been early in May and likely may have little to do with the problems we had in June. In June, even ICANN had been hacked. Mary Landesman over at antivirus.about.com mentioned Secunia as a useful tool to help with security issues on Windows PCs. I'll be giving my machines a run with that when I get a chance. Every once in a while I see a photo that just blows me away. 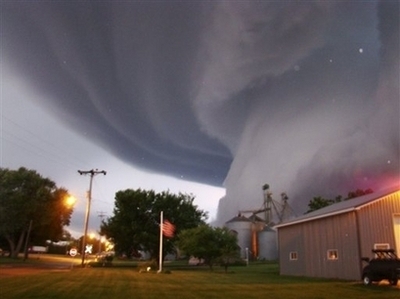 This tornado pic is a recent one. Saw this on Yahoo photos early in July (a month late!) during attempts to catch up on internet related things. 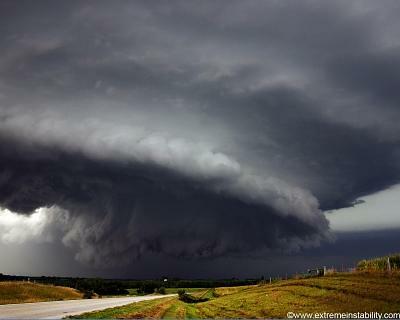 My current mesmerizing wallpaper is from my favorite storm chaser site, ExtremeInstability.com. These massive swirling clouds are scary and facinating. I tend to hold my breath when looking at these pics! Nathan Winograd's blog has some heartwretching pics and movie clips from animal control scenes. He labeled several of them as occuring at L.A. Animal Services, where Ed Boks is the General Manager. Mr. Boks has been very busy in the past year or so, trying to institute broad punitive legislation against pet owners and to cover the entire state of California. As can be seen from his actions and from his record (which includes being problematic to rescues), his interest in the welfare of animals is questionable and his interest in appropriately written legislation is poor as well. See him below, in his own words -- what he has to say when questioned by Senator Cox. There is a petition to have Ed Boks removed from his position as General Manager. If you agree, please sign the petition. This IS bigger than L.A. -- there are many areas around the country that are dealing with the Mandatory Spay and Neuter bills due to copycat officials that think L.A. has a good thing going. Amazingly they have not looked at the increase in animal deaths and abuse due to the MSN propaganda coming out of that area. The spending and the deaths of animals has INCREASED! These bills are seriously problematic at many levels. See Lloyd Levine in his own words... tell Senator Cox what the bill really means in this clip. The bill in its present form is a dangerous one and needs to be killed. Thanks for all that have been helping to get the information out there! I love the pictures of the Dogs. they are cvery beautiful.